Ryerson couldn’t find any insects in the Victoria building. But The Eye did. A bunch of them. On Monday night, reporters from The Eyeopener went into VIC 205, a classroom in which students reported seeing bugs in the tables, and found insects that were later confirmed by five exterminators to be bedbugs. The insects were hidden inside the cracks of the tables in the classroom. By Tuesday afternoon, Ryerson posted a notice saying classes were cancelled in the room. 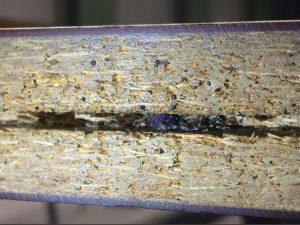 The Eye confirmed the insects were bed bugs after sending images of them to Abell Pest Control, 24/7 Pest Control, Merkem Pest Solutions, Pestend Pest Control Toronto and Just Bed Bugs. All five companies said they were bed bugs. On Tuesday afternoon, The Eye met with representatives from Ryerson to show them where the bed bugs were found. 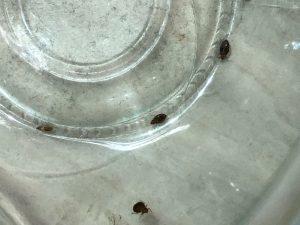 Ryerson then said a K-9 unit trained to sniff out bed bugs will examine the room. After that, VIC 205 will be sprayed to kill any bugs and the K-9 unit will come back to look for more. Dasha Pasiy, media relations officer at the university, said the room has been “investigated multiple times,” including with a K-9 unit, but all results came back negative. Pasiy said investigations are conducted all over the university and usually consist of “visual inspections” done by trained technicians in predetermined areas of the university like, kitchens, boiler rooms, loading docks and any areas where pest sightings have been reported. On Tuesday a class in VIC 205 was cancelled and another class was moved to different room. Second-year graphic communications management student, Lea AlHuneidi said she spotted the bugs on the first day of her Astronomy class this semester in room 205 when one crawled across her paper. She looked around to find three more on the table and two crawling on the jeans of student sitting next to her. AlHuneidi said she tried going back to class but couldn’t focus because she was too distracted by the thought of bugs crawling around her and said she failed one of her tests. Ksenia Chpak was in the same classroom last semester, when she found brown bugs on her sweater. Chpak went home with several bites on her hands, arms, stomach and back. 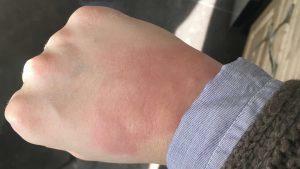 This semester Eye reporter Stefanie Phillips was also sitting in VIC 205 and noticed the bugs on her right hand. She brushed it off only to find more of them on her desk. A few hours later, in the same place the bugs had crawled, several itchy, red bumps appeared on her hand. After a day, the bumps swelled. Several days later, the swelling subsided and the bumps reduced to tiny scabs. 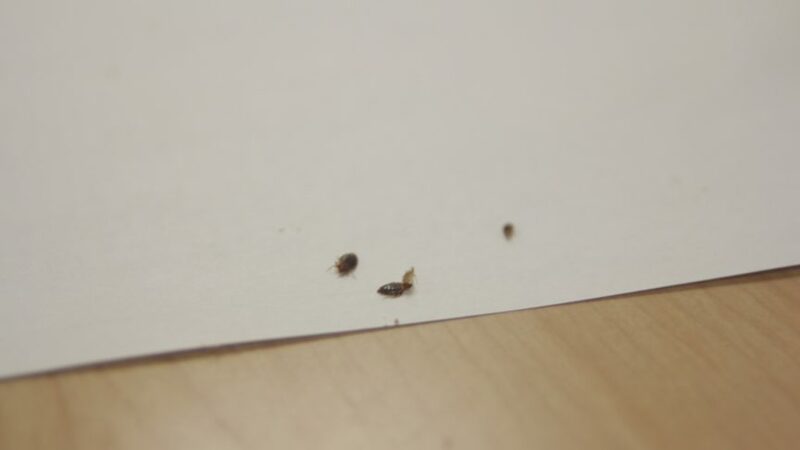 Mike Cardaci, the owner and operator of Just Bed Bugs, a bed bug exterminating company in Toronto, said it can take anywhere from one day to two weeks to get rid of bed bugs, depending on which method of removal the client decides to use. Judging by the size of the bugs in photos taken by The Eye, Cardaci said the bed bugs are in their adult stage, meaning that they are able to reproduce. He said on average one bed bug will lay between 300 and 500 eggs in their four-to-six month lifespan. A study conducted by Orkin Canada, one of Canada’s largest pest control companies, and the company Ryerson contracts for pest control, listed Toronto as the top city in Canada for a number of treatments conducted on bed bugs. I find it HIGHLY irresponsible of Canada’s top place for an Undergrad in Environmental Health to be brushing this off as nothing. Treat the entire building, RyeHigh, and do your due diligence. My profs from SOPHe should be raising hell! The fact that there are so many of them and that they’re adults means it’s quite possible they’ve already begun to spread. The whole building needs to be inspected and Ryerson needs to be communicating with students about this. ABSOLUTELY!!! They are NOT being transparent about this at all!